When DICE created the first battlefield game in 2002, they changed the nature of online gaming for ever. From traditional small-scale shooters, DICE created a game that was vast in every sense of the word. The maps ranged from relatively small urban maps (such as Stalingrad and Berlin) to large, open maps (such as El Alamein, and Midway), covering theatres of war from Eastern Europe, Western Europe, the Pacific islands and North Africa. With different kits to choose (Snipers, Assault, Medic or Engineer) you could choose how you wanted to play the game and even if you weren’t that good in fire fights you could support your team indirectly. The game had a staggering array of vehicles to play with as well; jeeps, half-tracks, mobile artillery pieces, tanks, submarines, aircraft carriers, destroyers, cruisers, fighter aircraft, light and heavy bombers. Further expansions added to this and enhanced the game with fighter-bombers, motorcycles, experimental jets and even jet packs. It was the game that brought the 1st Hussars together as a clan and it hasn’t been matched since, especially as subsequent Battlefield games have either focused on modern era combat or been limited for console players. The diversity of weapons, explosives and vehicles meant that the Hussars could truly shine in silliness and incompetence. From shelling your own team (accidentally) to rolling vehicles – any vehicles, blowing yourself up or killing yourself by forgetting your parachute, it was all good. The game also allowed for Jeep racing on the larger maps. Battlefield 1942 spawned some highly successful mods, catering for everything from driving addicts to pirate wannabes, realism junkies and those wanting to apply the Battlefield experience to more modern combat, from Vietnam to the modern day Middle East. The two most popular mods Forgotten Hope and Desert Combat. Forgotten Hope introduced a bewildering number of new vehicles, maps and weapons and aimed to accurately reflect the armies and tools in use during the different battles taking place over the course of the war, as well as reflecting more accurately weapon damage and armour penetration of the various tanks. Desert Combat introduced modern weaponry, land vehicles and helicopters in a contemporary setting. Like Forgotten Hope, it not only introduced different items but also added extra game modes. When DICE wanted to move away from World War 2, they chose the jungles of Vietnam. Although not a complete revamp of the game, BFV was successful if limited and felt more like a total conversion than a true sequel. It did introduce some nice features however, such as heat-seeking missiles and mobile spawn-points. It also introduced denser vegetation that could be hidden in – although if you turned your graphics settings down the cover was removed. It also had a fantastic rock soundtrack that could be activated inside any land vehicle and was an excellent way to give away your position! After the continued success of the Desert Combat mod for BF1942 it was inevitable that DICE would look at producing a modern-day version of their popular game. Indeed they even consulted with the modders responsible for creating Desert Combat as they designed what was to become Battlefield 2. Similar to Desert Combat the battlefields were the deserts of the middle east and the jungles of the far east. The forces fighting it out were the US military, China and a fictional Middle-East Coalition. 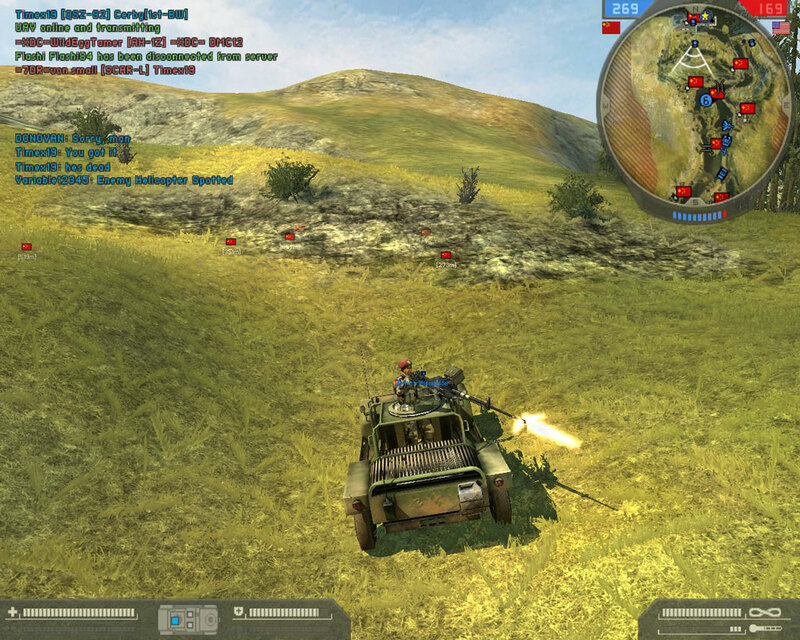 With the introduction of persistent ranking for online players, combined with their controversial ranked server program (only approved server hosts could offer ranked servers and only those servers earned experience for the players), this game also introduced a squad system, built around a squad leader and a commander system, who could call in UAV scans and artillery strikes. Battlefield 2 was a worthy addition to the franchise and many hours of great fun were to be had playing this game. The Commander’s UAV lessened the impact of the lone wolf snipers but the Jets were so fast that they were almost impossible to destroy, even with anti-air emplacements. An expansion (Special Forces) introduced the British SAS and Russian Spetznaz (amongst others), as well as fantastic new gadgets such as grappling hoops and zip lines. Instead of another expansion pack, DICE later created two DLC “booster” packs, European Forces and Armoured Fury, both of which unfortunately failed to take off (primarily because DICE still hadn’t integrated the expansion and booster maps with players who didn’t have them, so these players would be dropped from a server if it switched to a map they didn’t have). This was a great shame because there were some very good maps, weapons and vehicles within the boosters. For their next offering, DICE decided to fast forward some more and set the next game in the near future – Battlefield 2142. Rockets and Pulse rifles were the order of the day, together with mechanised walkers and jet-powered hoverships and drop-pods. There were many fun aspects of this game (including the very good Titan mode – where each side has a massive hovering vessel that the opposing team must assault and destroy to win) and the squad mechanics introduced in BF2 were tweaked to include squad-based unlockable rewards. Sadly, DICE decided to incorporate in-game advertising with the game, so even though many Hussars played the demo, almost none of us purchased or installed the game to play when it was finally released. DICE’s next forays into the franchise were console-only games, firstly with a console game using a modified version of the BF2 engine called Modern Combat, then later with a brand new Frostbite engine that included destructible buildings and terrain called Bad Company. Both had single player campaigns as well. However, as they were not released on the PC we aren’t interested in them and will say no more about them. After brief diversions with a free (micro-transaction supported) browser-based game (the heavily TF2 influenced cartoony Battlefield Heroes) and a mini-game using the Frostbite engine to redo some of the Pacific maps from Battlefield 1942, imaginatively called Battlefield 1943 (a game that despite many promises has at the time of writing yet to appear on the PC), DICE created a new version of the Bad Company game (a hybrid game that combined the Battlefield feel and use of vehicles with more enclosed maps and a more intense Call of Duty style gameplay), again with the destructible features of the Frostbite engine. But this time it was created for the PC as well. With PC gamers still reeling from the debacle that was Call of Duty: Modern Warfare 2, DICE wooed them with promises of catering to PC gamers with dedicated servers and post-release support. This crafty technique sadly didn’t live up to its initial promise; the dedicated servers were indeed there, but were locked down (as with previous ranked servers) and therefore did not support modding in any way. More telling was that when it was released, the PC version of the game felt unfinished – the connectivity to the EA plasma servers was flaky at best, the game itself wasn’t working as intended (team balancing and in-game VOIP simply didn’t work), in-game assets didn’t always work as intended and the weapon balance was off. It took several patches and a good few months to iron out most (but not all) of these problems and the situation felt strongly as if the pre-release focus had all gone on the consoles and not on the PC version. However, despite all of this, when the game did work it was incredible. The single player campaign was enjoyable and the look and feel of the game made it stand ahead of any existing games. The sound has to be experienced to know how good it is, with the impact of explosions and the chatter of gunfire knocking your socks off. Equally, the destructible terrain really does make a huge difference to gameplay – no cover is safe and the satisfaction with destroying trees to clear an area or blowing a hole in the wall of a building cannot be dismissed. The experience is so good that going back to normal FPS games without destructible terrain seems somewhat lacking after BC2. The graphics are also on par with anything else out there at the current time. The only negatives (apart from the initial teething problems) are the usual ones for this sort of game – the assault weapon damage being (by default) too weak, creating too much of a reliance on rifle-grenades, hand grenades and AT rockets, not to mention the usual plague of game-ruining snipers. Oh yes and the distribution of equipment to the different classes (only four compared to five in BF2 and BF2142) is also questionable. Still, it is a great game and will be enjoyed by many players for some time. DICE’s first main title to use the Frostbite 2 engine improved upon Bad Company 2 even if it did reduce the destruction. It was also the first major Battlefield title to include a single-player campaign, however flawed it may have been. DICE have tried to accommodate the old Battlefield fans while opening it up the the console players that have so keenly embraced the Call of Duty franchise with a combination of realistic weaponry and effects, combined with persistent statistics and character progression, simplified squad mechanics and another revision of the kit system. Battlefield 3 introduced the contraversial concept of “Premium” membership, a rather divisive feature where players pay for all DLC expansions up front and get early access as well as a few other goodies. The DLCs themselves were themed and some worked better than others; Back To Karkand (revisited some BF2 maps), Close Quarters (small scale infantry maps), Armoured Kill (larger more vehicular maps), Aftermath (post-earthquake maps) and finally Endgame (some other maps and capture the flag). Battlefield 3 was the first DICE game to use the Origin EA game-launcher system and a browser-based portal that acts as a server-browser, statistics logger, forum and friend tracker. Battlefield 3 is a fantastic (and sometimes frustrating) experience to play, which is generally better than BC2. DICE are still improving the game (and the Battlelog thing), improving functionality and game balance. Although DICE are clearly looking into making Battlefield a diverse and fully rounded experience, they are still struggling with the player limitation imposed by consoles and have yet to find a solution to adding DLC that does not divide the player base by introducing maps that not everyone has. Rather too soon for most players, DICE followed up BF3 not with another Bad Company title, but with another fully-fledged Battlefield title. Battlefield 4 is the current title and follows a similar theme to Battlefield 3, even down to the rubbish single-player campaign. Improvements to the engine include much more destruction as well as the “levolution” feature – the ability to have minor or major scripted events occur which can impact the immediate terrain (shooting out lights for example or setting off explosions), or more dramatic events that change how a map is played (a storm or dust cloud rolling in, or a major building collapsing). The game was beset by problems at launch (caused by a EA forcing them to release the game before it was stable so it could compete with the even more forgettable CoD Ghosts), including the major issue of client/server latency (“netcode”) problems. These problems were so bad and the reception was so negative that EA suffered share price falls and announced that future DLCs would be delayed while the developers resolved some of the more pressing issues. With due credit, DICE have rolled out a large number of server and client updates and continue to do so. They have also increased functionality of the Battlelog front-end. Some of the DLCs have now been released (China Rising and Second Assault were released on or shortly after the release date and Naval Strike has also recently been released), with another two DLCs due later in the year. Despite all the flaws in the game and the questionable weapon & class balance, it is like its predecessor, a very enjoyable game to play with friends.